Handwriting font that at random picks characters? First, I don't know much about creating fonts. I work with a childrens book author and want to create a font from her handwriting. This means that I have to have more then one character per letter and use them at random. I've found ways of creating a font from your handwriting (googled) – but not that has this capability. Anyone with ideas?? OpenType technology doesn't allow randomness so ‘randomness’ must be simulated. OpenType ‘randomness’ can be simulated using groups of letters know as alternates. The idea that you could have 3 groups or more of the same letters that rotate; you’d expect to never see the same letter more than once in a word. Unfortunately due to letter combinations, repetitions will appear. They have a 1-2-3 grouping system of letters that they call the rotator. However, they also created the Swapper to work on top of the Rotator. The Swapper looks back along the line to check if unlucky repetitions appear. If so, it'll correct the repetition of identical glyphs (in direct neighbourhood). If this isn’t enough they also mention OpenType randomness based on language and stylistic alternates too. This is probably the most complete example I know of for simulated randomness unless anyone else knows anything better!? You just have to be really smart and really dedicated to make it happen. Serious programming chops required. Most of the very natural looking handwriting fonts you'll find use contextual alternates and complicated ligature substitution. This actually achieves a more natural result than randomization. Some great examples of consistent substitutions can be seen in the script fonts from by Sudtipos. Their recent release Rolling Pen is an excellent specimen. For those of you who remember the great Beowolf font from Just van Rossum and Erik van Blokland, it's back. Kind of. FF Beowolf was born at the end of the dark and murky 1980s when Just van Rossum and Erik van Blokland found a way to change the programming in PostScript fonts. When printed, each point in each letter in every word on the page would move randomly, giving the letters a shaken, distraught appearance. Initially dubbed “RandomFont”, van Blokland and van Rossum created three versions with increasing degrees of potential randomness and FontShop released it as FF Beowolf, the first typeface with a mind of its own. The technology in FF Beowolf wasn’t what computer and printer manufacturers had in mind for desktop publishing. So, while it worked great (if a tad slow) through most of the 1990s, FF Beowolf was eventually barred from performing its magic: pesky things like printer drivers and operating systems learned to ignore the non-standard. 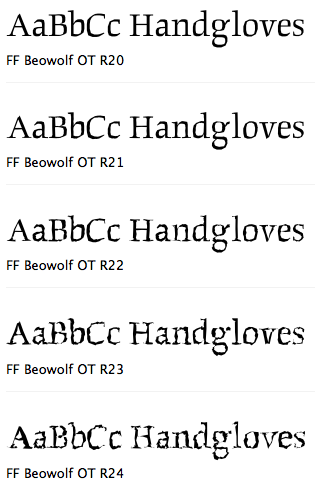 FF Beowolf seemed relegated to mere recollection. But OpenType technology brought new hope, forging paths in the typetech continuum which would eventually lead to a new generation of RandomFonts. Each glyph in each font has ten alternates and a massive Faustian brain to control the mayhem. 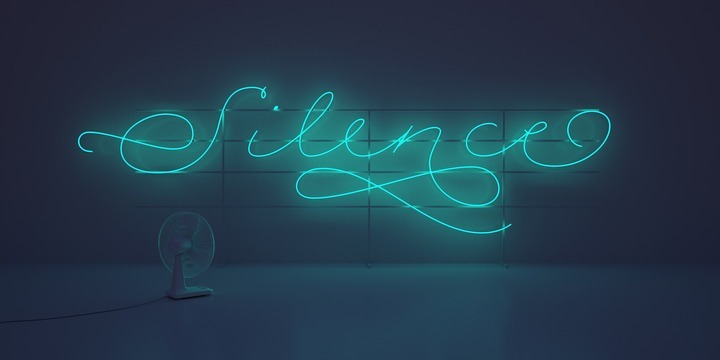 Specially developed and hellishly complex software, nearly ninety thousand glyphs, and an army of purpose-built ’bots took days to forge the OpenType features no ordinary type tool could have assembled. [...] The randomness performs on screen in any application on MacOS and Windows which supports OpenType. 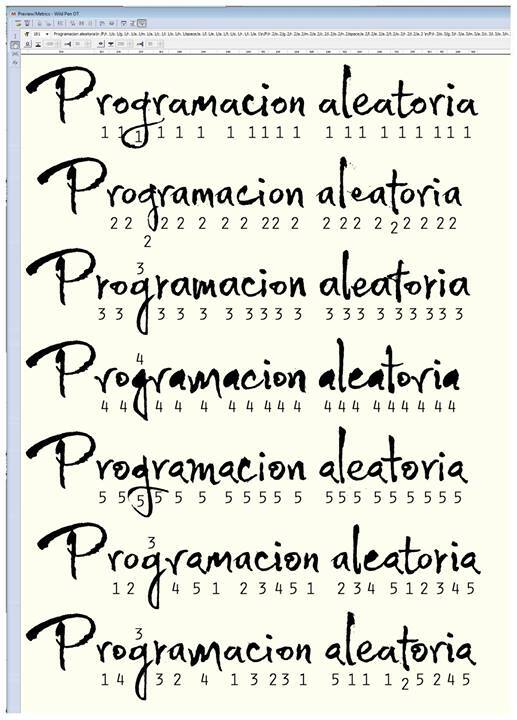 If you meed more information about how to programm randomly your font please feel free to contact me at my fan page on FB: Corradine Fonts. Luc Devroye has the best list I've ever seen of "random" fonts. I remember reading his paper Random fonts for the simulation of handwriting several years ago and being fascinated. In fact, I was searching for that paper when I found this question. Some of the links are defunct, but you can find for example MyFont on the Wayback Machine. I have never tried MyFont and do not endorse it etc., but it seems to be basically what you want. Opentype allows for randomized texts. Font Variations is integrated into OpenType 1.8 in a comprehensive manner, allowing most previously-existing capabilities to be used in combination with variations. In particular, variations are supported for both TrueType or CFF glyph outlines, for TrueType hinting, and also for the OpenType Layout mechanisms. Now for purchasing/licensing a suitable font, here is just an example from myfonts.com: Use advanced search and use two lines: tags include "handwritten" AND OpenType features include "Randomize"
You will find stuff like "Salted" and "Salted Sweet" or "Hand It". You might want to sort by price and start with the expensive ones. Providing handwriting simulation is a huge effort. There is a perfect example of a truly randomizing font: punk by Donald Knuth. It can be easily used in any TeX package e.g. in ConTeXt (see: Hans Hagen, The Punk Module). Real randomness is not possible. There is a part in the OpenType specification but support for this is non existing. But you can create a pretty random looking font with the OpenType calt feature. Depending on the strategy you choose creating the feature file for randomness by hand might be a frustrating experience. Programming a script to build the feature file is a more realistic way. Edit: In the meantime I finished a project of mine (Calligraphr) which enables even complete font novices to create a font with randomized letters. Not the answer you're looking for? Browse other questions tagged fonts font-management font-design opentype or ask your own question. PDF font embedding; any utility to batch test font collection? How can I identify what font was used in a Photoshop layer when the font is not installed on my computer? How does random choice of alternate characters work in OpenType fonts? How do I make sure the unicode box drawing characters work properly in my font? This japanese font could be identified? Font organizer that uses crowdsourcing to tag?